occasionally bikes. and some cats. but also travels, running, and food. Lululemon sponsored a gelato eating contest. To create fat people who will join their fitness club? The first step to kicking a habit is realizing that you have one. I know this because I've been reading Irvine Welsh's novel Trainspotting, about a Scottish guy with a heroin addiction. It's a pretty sharp, crass comment on punk society and social standards, etc, etc. Reading this book made me realize that I too have an addiction. To ice cream. I think this obsession came from the insanely hot summer we just had. Since every deadly-humid day topped off at 90º, I stopped wanting to eat anything warm. Hell, I didn't even want to eat solid food. When I'd finish my 7 a.m. run delirious and drenched in sweat, all I wanted to do was lay in a tub of ice. Then I'd yank open the freezer and consume frozen grapes like a vacuum. 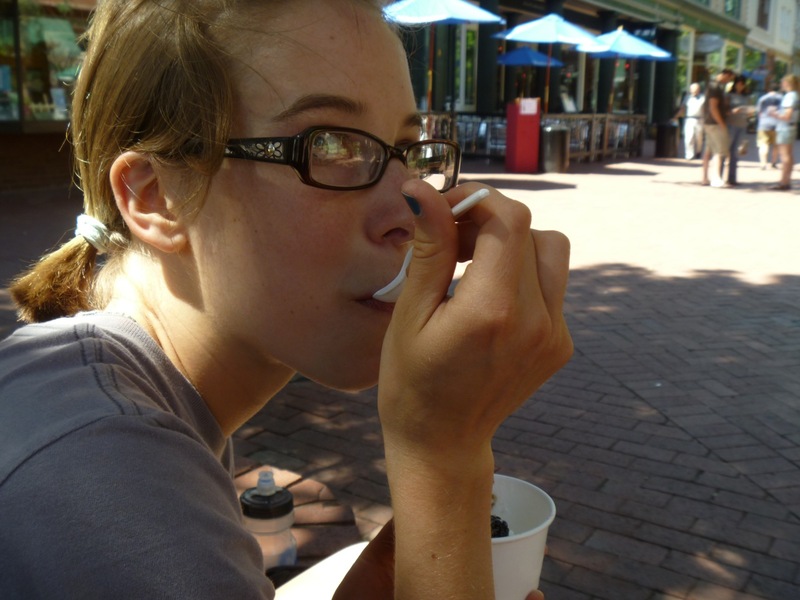 Naturally I gravitated toward ice cream as a day-closer. Eating ice cream helped me visualize a time when it wouldn't be a blistering three million degrees in the shade. Caught in the middle of a violent relapse in Boulder. During cross country season, the weather finally did cool off. I cut back on my sugary fat consumption a little bit. I'm pretty sure ice cream doesn't necessarily make you faster. And I didn't want to end up like the girl who sits alone on a couch in the student center nomming on a pint of Ben & Jerry's with a plastic spoon. Now that I'm not in competition mode, I've relaxed on the nutrition a bit. And once finals came in full swing, I bought my own pint of Ben & Jerry's. And then I started slipping myself little bits of ice cream after dinner. And today I ate a whole container of vanilla ice cream while "studying" for an exam. I've fed my ice cream addiction like you'd feed a stray animal - secretl,y behind the shed in your backyard. And then it gets bold. It sneaks into your house and makes a nest in your pantry. It hisses at you when you try to cook noodles. My ice cream addiction is living in my pantry. And I want it out. I've realized that running on the morning after a dairy binge is not fun. Neither is not fitting into my pants. I've even been cranking out extra miles these days to make up for all the nomming. Cringe. Then I saw the above Lululemon ad in an issue of Runner's World, and it made me think. 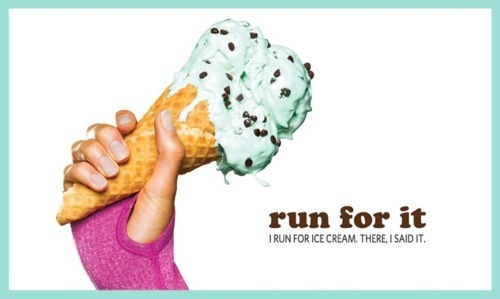 Should I really be running for ice cream? Aren't there better things to run for? Like records and medals... or charities.. or breast cancer? If I really wanted to do something for ice cream, I'd start training for an ice cream marathon instead. (Record for 1 gallon, 9 oz vanilla: 12 minutes, Cookie Jarvis). So my last exam is tomorrow. Then goodbye, ice cream animal. Please stop hissing at me. runner, writer, eater of foods... and hilariously poor cyclist. An Open Letter to the Middle School Mean Girls Who I Ran Past Today.